Director N.Shankar is said to have made few changes to the story and screenplay of the film to suit the Telugu audiences’ taste and preferences. Actor Sunil, who hasn’t had a great run in his career in the last few years, is back in the reckoning with a film directed by N.Shankar titled ‘Two Countries’. The film is said to be rom-com and has Sunil playing a young man who falls in love with a girl who comes to India from the US. The teaser of the film was released by the makers on Friday and it was launched by Power Star Pawan Kalyan. 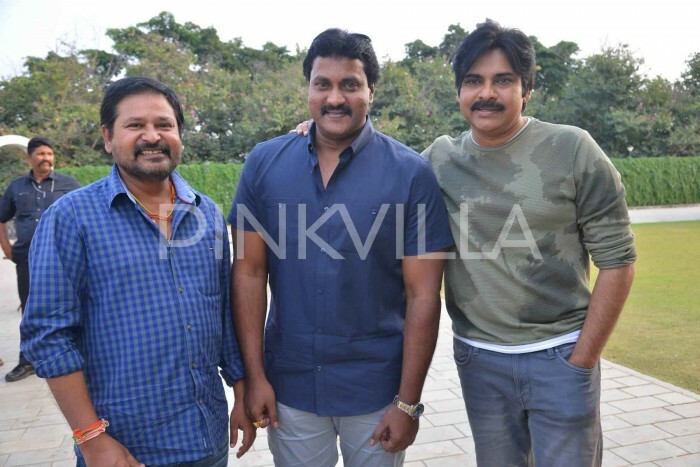 Actor Sunil and director N.Shankar visited the shooting location of Pawan Kalyan’s upcoming film, PSPK 25, where the star launched the teaser officially. ‘Two Countries’ is a remake of a Malayalam film with the same title which starred Dileep and Mamta Mohandas in the lead roles and was directed by Shafi. Director N.Shankar is said to have made few changes to the story and screenplay of the film to suit the Telugu audiences’ taste and preferences. Sunil, who has had a not so good run at the box office in the last few years, will look to make a comeback with ‘Two Countries’ and get back on track in his career. Besides Sunil, ‘Two Countries’ stars Manisha Raj as the lead actress which was played by Mamta Mohandas in the original Malayalam film. Sunil also has the film with Trivikram Srinivas that has Jr NTR in the lead role which will go on floors in January 2018. It is being reported that Trivikram has etched out a full length role for Sunil in the film which will stand as a highlight in the yet-to-be-titled film.